The spring of 1941, Europe was eighteen months into a resumption of the hostilities that were little more than act two of the drama begun in 1914. The cast of characters was much the same, but the plot had developed twists that would bring revulsion to even those hardened by the carnage of the first bloodletting. America, behind her two broad oceans, was at an uneasy peace. Despite the alarmist warnings of the isolationists and heartfelt rallies by groups like America First, few of those whose job it was to plan for the nation’s security felt the United States could much longer remain deaf to the tocsins of war. The United States had no separate air force. Instead, the army and navy split the responsibility for military aviation. The land-based air arm, the U. S. Army Air Corps, was under manned, poorly equipped and hardly ready to take on the powers that threatened America. But that was changing. The country, the government, and the military had finally awakened to the need to rearm. In 1939, led by General Henry Arnold, the Air Corps began an expansion that doubled the number of air groups from fifteen to thirty by the end of 1940. New airplanes to replace the aging bombers, transports, and pursuit planes were in various stages of design and testing. Now the growing air service needed fliers. Congress had passed the first peace time draft in 1940 and extended it for another year in 1941 by one vote in the House of Representatives. Facing the draft and a year in the army, many young men looked to the sky as a better and more adventurous way to serve their country. 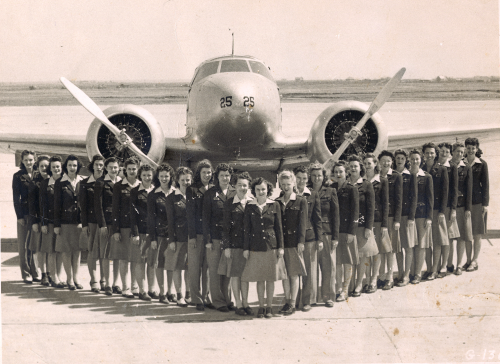 There was no shortage of would-be aviation cadets. There was a shortage of places to train them. 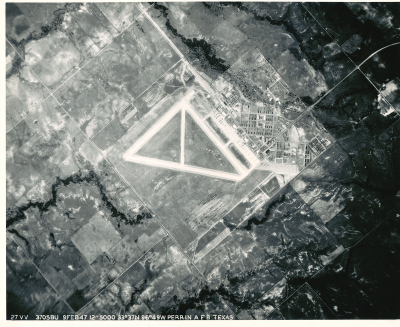 Community leaders in Grayson County led by County Judge Jake Loy saw opportunity in the wide open skies over North Texas and in the spring of 1941 began talking up plans to bring the Army Air Corps to Grayson County. In March, Loy traveled to Washington, D.C. to meet with army and War Department officials and enlist the aid of the county’s representative in congress, Sam Rayburn of Bonham, recently elected Speaker of the House of Representatives. Loy already had pro vided the government with a wealth of information about the proposed site and other factors on which the approval of the project would hinge, and he came home with more than just promises. In April, 1941, the Air Corps came to Sherman to meet with local officials and inspect a site for a proposed primary training school. An Air Corps board met a month later and wrote a report recommending the establishment of the flying school. On June 10, Grayson County voters agreed to a $60,000 bond issue to purchase the land furnish railroad rights of way, highways and utilities to the field. The one dollar a year lease agreement between Grayson County and the United States Government was signed on July 1, 1941, and construction on the air field started that same week. Major Robert J. Warren, project officer and temporary base commander, arrived on August 9, and five enlisted men from Goodfellow Field in San Angelo came to Sherman ten days later. Throughout the balance of the summer and the fall, work proceeded apace. By the first week in December, most of the buildings were either finished or nearing completion, most of the roads had been paved and the water tower had been finished. On the first Sunday in December, there were 90 officers and 545 enlisted men on duty at the Grayson Basic Flying School. Half a world away, more than four times that number of American soldiers, sailors and Marines would die in the few terrible hours that introduced America to war. Colonel Elmer D. Perrin was a Texan, from San Antonio. He joined the army in 1917 and received a commission as a second lieutenant in the Air Service in July, 1918. Perrin stayed with the Army Air Corps following the Armistice and the end of the Great War in Europe. 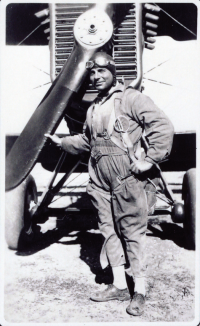 He became one of the aviators who dedicated their careers to proving the worth of military aviation under the leadership of an iconoclastic brigadier-general named Billy Mitchell. In 1939 Perrin became the service’s representative at the Glenn L. Martin Aircraft Company in Baltimore. Perrin got the silver oak leaves of a lieutenant colonel in the spring of 1941 and was involved in testing and developing the B-26 Martin Marauder medium bomber. The Marauder was considered by many fliers a complex and difficult airplane to handle, with a high landing speed and overly sensitive controls. It was a controversial airplane from the time it was accepted by the army. History proved its worth, however, and the B-26 became the most significant medium bomber used in the European war. On June 21, 1941, Perrin and A. J. Bowman, a civilian inspector, took off from Martin Field in a new B-26. Shortly after takeoff, the plane went into a sudden dive and crashed, killing both men. The Martin Company’s investigation of the crash suggested the plane had been sabotaged. Posthumously, the army promoted Elmer Perrin to colonel. A year after it received its first class of cadets, Perrin Field had a troop strength of more than 4,000. This number dropped to the more normal 2,800 as more training facilities opened in Texas and other parts of the country. Mid 1943 saw cadet classes of 300 to 400 students, with more than 500 mechanics and technicians working in twenty-four hour shifts to maintain the BT-13s and AT-6s assigned to the field. By the close of the war in 1945, Perrin Field had graduated more than ten thousand student pilots, from the United States and five foreign countries, Brazil, Mexico, Guatemala, the Philippines and Ecuador. The base was also home to another group of foreign visitors, albeit unwilling ones, two hundred German POWs had made Perrin home while they worked on the Denison Dam. Pilot training ended early in 1946, and even though an instructor school had been set up to maintain flight instructor proficiency, the base was deactivated in November and became a storage facility. When Perrin came to life again, on April 1, 1948, it was part of the newly created United States Air Force. It had a new name, Perrin Air Force Base, new blue uniforms and an old mission, basic single-engine pilot training. For a time, in 1952, the base offered advanced single-engine training and hosted training for the B-26 medium bomber. Charles L. Brown, left, premed studies at Rice Institute in 1951 and volunteered for the U.S. Army. After training at Schofield Barracks in Hawaii, he served in Korea as an infantryman. “I liked the military, but I didn’t like carrying a pack and a rifle, so when I got an early out in 1954, I transferred to the air force,” Brown said. As an air force staff sergeant, he came to Perrin in 1963 to teach small arms marksmanship. “I was an instructor at Lackland AFB before I came up here. I went through the USAF marksmanship school and worked down there for five years. I transferred up here because my wife was from this area,” Brown said. He spent three more years training shooters before hearing problems prompted him to change jobs. Calling on his premed training at Rice and the continuing education college-level courses he had taken while in the service, Brown became a pharmacy technician. Brown left Perrin in 1968 and went to Turkey. He retired in 1972, came back to Sherman and went back to school to become a nurse. He worked for fourteen years at Wilson N. Jones Memorial Hospital as a nurse anesthetist. Today he lives in Sherman and is the proud owner of a restored Vietnam-era army ambulance. Brown and his big white truck with the red crosses can be seen regularly at parades and civic events. The roar of jets cracked the skies of North Texas in the early 50s. Larger and longer runways were constructed, and T-33 trainers and F-86D Sabres could be seen on the Perrin flight lines. In 1962, the base became home of the 4780th Air Defense training wing and the largest deployment of F-102 Delta Dagger interceptors in the country. Utilizing nearby Lake Texoma, the Air Force set up a support and ejection training and survival school at the base. During its run, the school graduated more than eleven thousand air crew, including seventeen NASA astronauts. In all, forty-nine future space men passed through Perrin for one purpose or another over the years. Ever encroaching civilian aircraft traffic from the new Dallas/Fort Worth International Airport that opened in 1974 and changing dynamics in pilot training ended Perrin’s life as a military base. On June 30, 1971, thirty years to the day after the Army Air Corps signed the lease to 1160 acres of Texas prairie for the Grayson Basic Flying School, the military’s involvement at the field ended. After a four-year tour in Oklahoma City as a recruiting supervisor, Elkins came to Perrin. “I worked about a month on the flight line as an aircraft maintenance control supervisor, and then the wing commander called me in and asked me to be the wing sergeant major. It was two years of the finest duty I ever had. About six months before I retired, we learned Perrin was closing, so I just went ahead and put in for my retirement. I retired on January 1, 1971.”Elkins stayed in Grayson County and now lives in Luella. He is one of the founders of the Perrin Field Historical Society and the Perrin Field Museum. 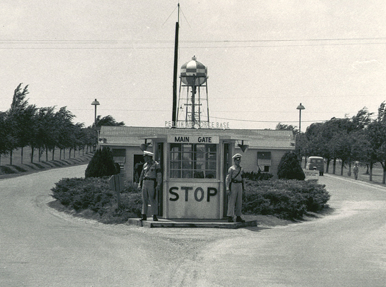 When Perrin Air Force Base closed, the property, by then more than 1,800 acres in size, reverted to the county, becoming the Grayson County Airport. In 2007 it was renamed North Texas Regional Airport – Perrin Field. Ben, someone just posted a comment that mentions 4780th Supply Squadron. Hi; anyone stationed at Perrin AFB (ADC) DURING 1963-1966. Dad was transferred from the 460th FIS (Portland AFB) in March 1966, this was our first time to remain at on base for over two years. Dad retired in February 1969 as squadron commander of the 4782nd CCTS. We relocated to eastern Washington, but returned to Denison in 1973. Does anyone have any photo’s of the 4782nd CCTS aircraft (Convair F-102)?